This is what it's all about here at MLSP. You can apply what you learn from the leaders to grow your downline, grow your affiliate income from MLSP, or just as well, you can create your own products and get your brand out there to your marketplace. Doesn't matter what you want to market online, MLSP will show you how to do it right. How to attract your best target market to what you have, and convert them from prospects to sales!! That's exactly what Marlon Troy Hurd proved this week, when he crossed the $1,000 mark selling his own product! Great job Marlon. Can't wait to see what's next for this guy. He Had His 2nd $100 Day This Week! 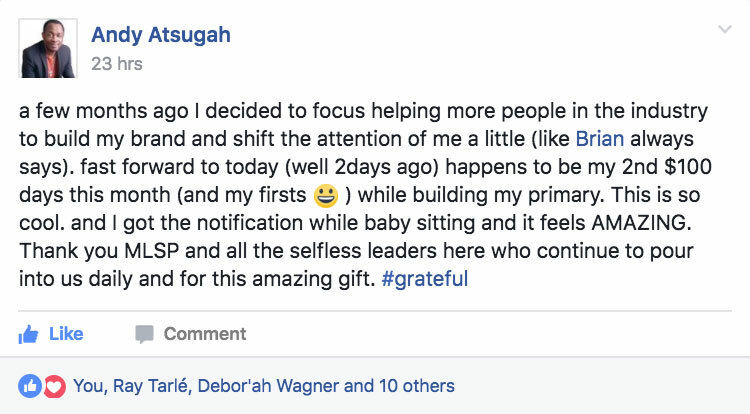 Andy Atsugah is experiencing what it's like when your marketing is actually effective. Why focusing on your prospect's needs and desires, rather than always focusing on yourself changes results in a huge way. It's worth noting that Andy made a point to thank the selfless leaders inside our community. This is what makes the difference with MLSP. The community will blow you away with their generosity and complete willingness to help ALL the time! She Took Immediate Action and 53 People Responded to Her FB Post! If you've been hopping on the MLSP Training Webinars then you've seen just how absolutely full of value they are! But believe it or not some people let all this value go to waste. You see, watching the training doesn't get you leads & sales. They show you HOW to get leads & sales, but it's up to you to make it happen. MLSP member Becky Thames didn't do that. Becky actually took action on what she learned. IMMEDIATE ACTION in fact. And what happened next was pretty fantastic. 53 responses to one FB post. When you scroll down you'll see the EXACT post that she made. 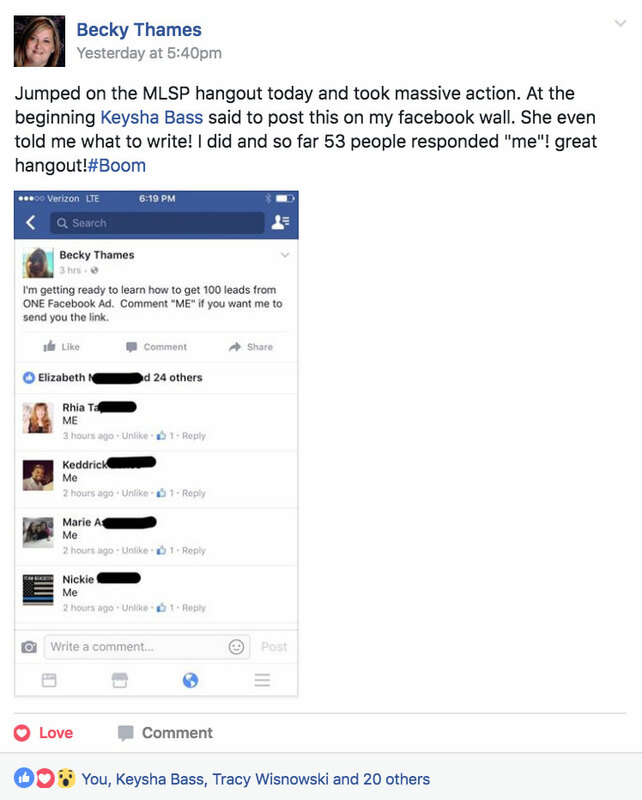 In fact SHE learned what to post from L5 Honey Badger Keysha Bass on last week's Top Earner Hangout! Pretty cool huh? Keysha told her what to do, Becky did it, and got immediate results. Maybe you should try it yourself this coming Tuesday! A lot of people are afraid of webinars. They know they should do them, and they know that they work because it's been proven over and over again. Yet many people leave all the leads and massive sales on the table because they won't do webinars. Even though we have one of (if not THE) BEST webinar training anywhere online with L5 Steve Jaffe. Paula Walker may have been afraid of webinars as well. But if so, it didn't stop her one bit. She just did her first one this week, and we couldn't be more proud. Great job Paula! That's a big move, and massive results are on their way to you, we can feel it! 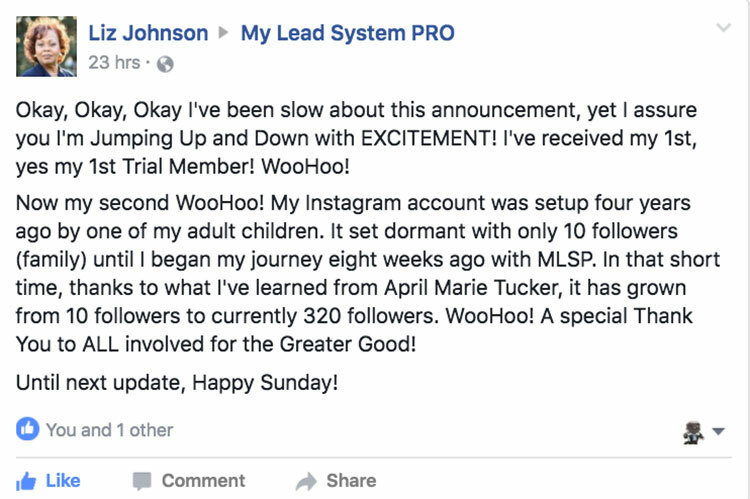 Liz Johnson has made some pretty awesome progress during her time here at MLSP. Perhaps one of the best things she could have done was to follow L6 April-Marie Tucker's Instagram training. April lays it all out there in her course. She put her heart and soul into that course, and Liz is living proof that it works. Remember action is the key to this business. 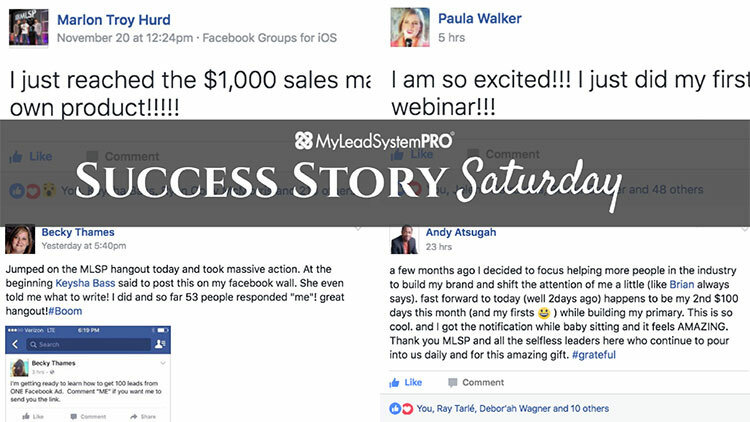 You've seen with these success stories, and more that you'll see below what happens when you take action! Let us know in the comments how you'll be taking action this week!